You are looking for home remedies for a migraine so I can assume you know how a simple headache can be monstrous too! You dread that horrible migraine attack which not only brings nausea, vertigo and dizziness along with a headache but also makes you confined to your bed in a dark room. The analgesics seem incompetent when it comes to relief from a migraine. Even if they work for you, overusing painkillers can actually worsen off the condition. If you take OTC painkiller twice a week, it’s all right but more than that may ‘rebound’ your migraine. It will initially decrease the pain but eventually will bring back your migraine headache which is even stronger and worse than ever. In such a situation, home remedies for a migraine can only save you from the debilitating experience of a migraine attack. Feverfew (Tanacetum parthenium), due to its name suggests that it is a herb used to cure fever. However, feverfew is one of the oldest herbal remedies for stubborn headaches including a migraine. When you use feverfew leaves, you instantly feel that the intensity of your migraine headache has been reduced. The magical compound in the feverfew herb is called parthenolides which works by controlling the expansion and contraction of your blood vessels. When your brain signals the blood vessels to get constricted, feverfew will keep them dilated. It also improves the tone of the blood vessels so that you may get fewer headaches over time. Feverfew also neutralizes the chemicals known as prostaglandins that have been known to give pain and swelling. While the best remedy for a migraine with feverfew will be to chew on a couple of medium sized feverfew leaves, you can also make tea out of this herb to get relief from your migraine attacks. It is as simple as this. Just chew 2-3 fresh leaves of feverfew plant. However, many of you will find it difficult to chew fresh leaves as it may make your tongue lose the sense of taste. If it happens with you, try chewing dry feverfew leaves. Place the feverfew herb in a pot. You may also add some other herbs like lavender and chamomile flowers, lemon balm leaves etc. to make your tea more flavorful. Let it steep for 10-30 minutes depending upon how strong you want your tea to be. Then strain and mix honey if using. Drink this tea to get relief from a migraine headache. You may continue to have this tea daily for about 2-3 months or more if you want to cure a migraine and avoid recurrence of migraine attacks. Feverfew gives the best result when used with white willow bark which is also our next remedy for a migraine. Precaution: You may or may not get muscle stiffness, nervousness, mouth ulcers, canker sores, loss of taste etc. and sometimes upset stomach too. If so, stop using this herb and consult your doctor. Pregnant and breastfeeding mothers should not use feverfew herb. White willow bark has long been used to cure pain and inflammation. The chemical ‘salicin’ present in willow bark has active ingredients similar to those found in aspirin (acetylsalicylic acid). It also contains powerful anti-inflammatory compounds known as flavonoids. Both salicin and flavonoids together make this herb an effective pain-relieving and anti-inflammatory natural product. The only concern remains that it works slowly and you may not get instant relief but once it starts working, the effect will last for long. How to Make White Willow Bark Tea for Migraine Relief? Add willow bark to water. Reduce the flame and simmer for 10-15 minutes. Put off the flame and let it steep for another 30 minutes or so. Drink 3-4 cups of this willow bark tea daily. Precaution: If you are allergic to salicylates like aspirin, avoid using willow bark. Also if you suffer from diabetes, gout, asthma, gastritis, hemophilia and stomach ulcers, consult your doctor before having this herb. Those taking blood thinners and nonsteroidal anti-inflammatory drugs (NSAIDs) should also consult their healthcare providers. This herb is also not suitable for children under the age of 16. Butterbur (Petasites hybridus), the perennial shrub found in Europe and parts of Asia and North America, gets its name due to its large leaves that are used to wrap butter in summers. 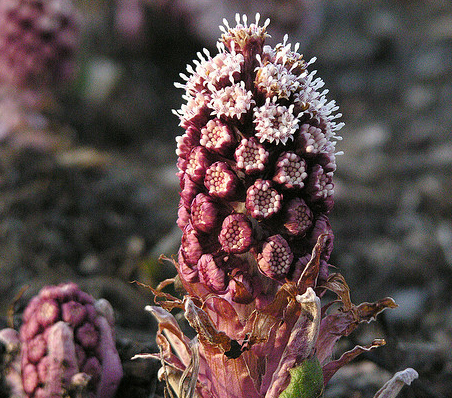 Traditionally, butterbur has been used since ancient times for treating pain, fever and spasms. The modern medical herbalists, however, depend on this herb to cure migraine headaches as well as asthma. This herb contains the components petasin and isopetasin that reduce spasms and inflammation to give you the much-needed relief. Studies have been conducted with the extract of butterbur called Petadolex that has successfully reduced the frequency of migraine attacks during experimentation. However, because this herb also contains pyrrolizidine alkaloids that can damage your liver, it is not at all advisable to use it in raw form or as teas or tinctures. Butterbur supplements are available in the market that comes without the liver toxic compound. How to Take Butterbur Extract for a Migraine? If you want to use butterbur herb, go for commercially available butterbur supplements to save your liver from getting damaged. These extracts are made after elimination of the toxic compound found in the herb. Take 50-75 mg of butterbur twice daily. You should, however, consult your doctor before you go for any supplement for a migraine. Precaution: Pregnant and nursing women should avoid taking butterbur supplement. Ginger has been used in Asia, especially India and China since ancient times to treat various diseases including headaches, nausea, indigestion, arthritis, cold and flu etc. Ginger root herb is very effective if you are looking for some remedies to get rid of that nauseating feeling which accompanies a migraine. It is also beneficial in relieving headaches. It works by blocking prostaglandins which stimulate muscle contractions, control inflammation and also affect certain hormones. One of the studies conducted to find out the efficacy of ginger as migraine remedy stated that when combined with feverfew, ginger is effective in curing a minor headache that indicates a migraine attack. How to Make Ginger Tea for Migraine Relief? Add sliced ginger root to this and simmer covered. If the cause of your migraine is stress and tension, chamomile will give you relief from this debilitating feeling. Chamomile is a known herb for medicinal use in nervous disorders like anxiety, irritability and even insomnia. This herb works by slowing down your nervous system’s activity. This makes you relax and maintain a sense of calm. One of the reasons why chamomile is one of some good remedies for a migraine is its quality to reduce pain and inflammation. However, if you hope to drink a cup of chamomile tea and get rid of all migraine discomfort, it’s not so. You need to drink this tea throughout the day so as to ease your migraine headache and give you some rest. How to Make Chamomile Tea for a Migraine? Add chamomile to the hot water. Add honey or maple syrup if using. Drink 1-2 cups of this chamomile tea at a time. Drink chamomile tea 3-4 times daily. Basil is yet another good remedy for migraine headaches. This herb, basil works as a muscle relaxant to cure headaches induced by tension and tight muscles. Basil herb is an excellent antispasmodic, antiviral, antibacterial, anti-inflammatory and a muscle relaxant apart from having many other properties. Its muscle relaxing quality is best when blended with lavender. While its analgesic property cures a headache, its antiemetic property reduces nausea and vomiting. There are many ways you can use basil to get relief from a migraine. When you experience a mild headache indicating a major migraine episode, chew some fresh basil leaves. You may also massage your forehead and temples with 3-4 drops of basil oil. Make basil tea by steeping 5-8 basil leaves in hot water for 5-10 minutes. Drink this tea to get relief from migraine nausea as well as a headache. Make a basil compress by adding witch hazel to basil tea. Here’s the recipe. How to Make Basil-Witch hazel Compress for Migraine Relief? Take 2-3 cups of water and bring to a boil. Add 1-2 tsp of dried ground basil and let it steep till it cools down. Now add 2 tbsp of witch hazel to this basil tea. Take a cloth and soak it in this basil-witch hazel dip. Wring out the excessive water. Place this cool basil-witch hazel compress on your forehead covering your temples too. Peppermint is a combination of water mint and spearmint. Traditionally peppermint oil has been used as a herbal remedy for headaches, nausea, gas, indigestion, skin irritations, anxiety, diarrhea, menstrual cramps, muscle and nerve pain among other diseases. Peppermint can really calm you down and numb your pain. Peppermint oil can be said one of the best remedies for migraines. Massage your forehead and temples with peppermint oil. Crush some peppermint leaves and apply the paste on your forehead. Add 2-3 drops of peppermint oil in hot steaming water and inhale the steam to get relief. Just as peppermint oil is good for a migraine headache, mint tea prepared with leaves of a mint herb is also beneficial for getting relief from a migraine headache. The main components of mint, menthol and menthone are capable of relieving headaches. You can either sip its tea or use the tea as a compress. Make mint tea as per the recipe above in the 1st way to use mint. As you need 2-3 cups of the tea, increase the amount of herb. Soak the cloth in this tea and wring out the excess water. Place this cloth on your forehead and temple to get relief from a migraine headache. When it comes to a migraine herbal remedies, aromatherapy has also proved itself to be of great use. It uses various therapeutic grade essential oils to give you relief from migraine symptoms, especially headaches. Peppermint, eucalyptus, and lavender oils are particularly helpful in getting rid of a headache. While lavender oil reduces muscle spasms and nervousness, peppermint and eucalyptus oils relax mind by having a calming effect. Here is a recipe for making a compress using these essential oils so that you get relief from your migraine pains. Take the water and add the drops of all the three essential oils to it. Soak the washcloth in this aromatic water and wring it out gently to discard excessive water. Place this cloth over your forehead to get relief from migraine discomfort. Cover your eyes too for soothing effect. Rosemary essential oil is considered a very good oil for stimulating the brain and improving memory as well as mental clarity. The components of rosemary oil give it analgesic properties which is helpful in relieving headache. This oil is nervine in character which means it strengthens, calms and soothes your mind as well as muscles. As this oil acts on the brain and the central nervous system, it can excellently address the issues of headaches, migraines, neuralgia, mental fatigue and nervous exhaustion. Add a couple of drops of rosemary oil in hot steaming water and inhale the steam for few minutes. Pour 1 drop of this oil on a cotton or tissue and bring this close to your nose. Inhale but remember do not use more than 1 drop initially as strong smell may trigger your migraine headache instead of curing it. Massage your forehead and temple with 2-4 drops of this oil. Dilute 4-5 drops of rosemary oil in your bath water. Rosemary oil also blends well with other essential oils like lavender and peppermint oils. You may blend 1-2 drops of each oil to get a massage or make a compress to relieve a migraine headache. While lemon oil is in itself very refreshing and can soothe your nerves, what is easily available is the lemon peel. Did you know that women in Indonesia used to do dishes with hot soapy water with lemon rinds in it! Just as many people soak their palms in warm water treated with essential oils, these women did it with simple lemon juice or peels while doing their daily chore. It seems that warm lemon water helps in blood circulation and also reduce the swelling of blood vessels. Ayurveda also talks about lemon peel for migraine relief. With its anti-inflammatory properties, the peel of lemon can really help you. Grind or crush them using water to make a paste. Apply this paste on your forehead. It is said that carrot juice helps in efficient blood flow towards the brain. This may be the reason why this carrot juice can cure your headaches. Combining carrot with other herbs and vegetables known for their qualities of affecting migraine headache can enhance the effect of this juice. For example, spinach which is rich in antioxidants, vitamins, especially Vitamin B group, magnesium etc. that are essential for relieving migraine headache. Ginger, as we know also relieve you of a headache, as mentioned earlier in this article. This recipe of carrot juice uses all these and some other ingredients that will only help you in getting rid of migraine headaches. Using your juicer, make juice of all these vegetables. Drink it to cure your migraine headache. Dong Quai (Angelica Sinensis) has been traditionally used in Chinese and Japanese medicine to treat headaches, fatigue, inflammation, and nerve pain. Dong Quai belongs to the family of carrots, parsley, and celery and is particularly beneficial in reducing premenstrual migraines in women. During this period, many women are affected by a migraine headache due to fluctuating hormonal levels. Studies have shown that phytoestrogenic properties of this herb dong quai may reduce the frequency of migraine headaches. Some researches have shown its active ingredients ‘coumarins’ to be effective for migraine relief as they dilate blood vessels and stimulate the central nervous system. This increases blood flow throughout the body. As this herb affects the hormonal level of women, it is recommended to be taken under the expert guidance of medical herbalists. Rinse the herb properly but not for very long so as to preserve its qualities. Add water and dong quai to the pot. AS metal pot may interact with the herb’s properties, it is advised to use a clay pot or stoneware. Cover the pot and heat over medium heat for 10-15 minutes or till it is brought to a boil. Now reduce the heat. Simmer for another 20 minutes. Remove when the tea remains half of its original quantity. Add honey and drink this tea. Precaution- If you are pregnant or a breastfeeding mother, do not use this herb. Also, stop using during your menstrual cycle as it may lead to heavy bleeding. Not all of these home remedies for a migraine will work for your specific problem. You need to experiment with them to find out which works for your migraine problem.